Supergirl picks up the pieces from Lex’ escape with the characters looking to focus on the weak link in his organisation in the hope of tracking him down. The weak link in Lex’ organisation is immediately identified as Eve. It’s unclear what makes her more exploitable than any other part of his organisation but the characters certainly feel that their familiarity with her is their best chance. The episode can’t seem to decide if the characters never truly knew Eve or if they have a good idea of the sort of person she is. Evidence would certainly suggest the former but Lena outright says early on that she knows Eve when the whole point of her betrayal was to illustrate how little Lena or anyone else knew her. Either way tracking her down is the objective that propels the episode and it’s as good as anything else at this point. I mentioned last week that Eve’s allegiance to Lex was poorly developed and unfortunately this episode does nothing to remedy that. Even though it’s titled “All About Eve” it actually isn’t really about her at all which is disappointing as she is a character in need of context to add the necessary depth. The closest we get to insight is through her cousin Bitsie (Jill Morrison) who was cured of Cancer by the Harun-El serum. This doesn’t really explain why she was working with Lex as working with Lena to make such a serum readily available to the public would mean that her cousin is cured but it suggests that family is one of her underlying motivations and could have been connected to working with Lex if some work was put in. Unfortunately it plays out as not much more than another lead to be investigated in order to provide a clue that points in the direction of the next lead. This scene does feature another strong example of Kara using her ability to appeal to the better nature of people when she encourages Bitsie to help them find Eve in the interests of avoiding her being in more trouble than she already is. Moments like this are always appreciated as it reinforces that Kara’s heroics extend far beyond her powers. Lena, Alex and Kara teaming up to chase down clues that will lead them to Eve is really strong. All three of these characters are well developed on their own and seeing them share screen time is always good. The episode carries the subtext of Lena’s animosity towards Supergirl that is unfortunately quickly resolved here rather than continuing to add texture to their relationship. Before the resolution there was the concept of Lena seeing this as a necessary professional arrangement rather than something she actually wanted to do. This is altered when Kara finds the Harun-El and makes it clear to Lena that she doesn’t approve of it being used. She focuses on the negative aspects such as giving Lex powers and Lena retorts by pointing out that it saved James’ life. This causes Kara to back down and take Lena’s point that she is blinded by her own outlook on the situation. All told this feels like a really simplistic resolution that doesn’t take into account all aspects of the argument though having this resolved is preferable to dragging out what could easily become a melodramatic conflict. Much of the rushed aspect of this reconciliation is saved by Kara’s reasoning behind her disapproval. She talks about feeling the weight of the world on her shoulders after the departure of Superman and Lex’ newfound freedom so is concerned about dealing with that responsibility. Lena’s research represents a threat to her because it can make her enemies stronger which makes her weaker by extension. Kara is basically worried about appearing weak and losing which would make her unworthy of the responsibility that she has taken on. Melissa Benoist’s performance in this scene is excellent; she conveys the release of emotion from Kara beautifully. The episode treats it as if Kara’s change in attitude makes her concerns invalid which is a problem as there are legitimate issues with what Lena is doing that aren’t simply explained away by the serum doing some good. There’s still a lot of fallout to deal with and I suspect it will be used to give rise to another villain at some point which should raise questions around Lena’s accountability. There is a very clear and effective visual example of how well Lena, Kara and Alex work together as a team. The sequence involving the Zombie Metallo needs all three of them to pitch in using skills unique to their particular character. Kara is responsible for keeping it busy but has a finite amount of time to do so because of her proximity to Kryptonite while Lena sources the necessary chemicals to create a makeshift grenade and Alex is needed for her aim as well as her grace under pressure. It’s a creative sequence that comes from the established characters rather than simply involving them. In general this is a great episode for Lena who shares a few scenes with Lillian. There is a constant metaphoric game of chess going on between them as they constantly try to one-up each other. Lena does really well to avoid being manipulated by Lena in this instance and even successfully gets the upper hand when she points out that Lex is planning to break into the prison to murder her rather than rescue her. This makes Lillian feel somewhat betrayed by both of her children who both want nothing to do wit her. Interestingly they both have defined ways of avoiding being controlled by her with Lena constantly flaunting her freedom and Lex looking to take her out of the picture forever. 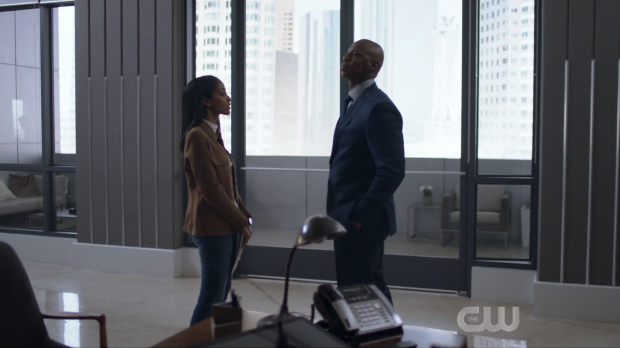 Hopefully we’ll get to see Lex interact with Lillian before the end of the season. Lena and Lillian’s scene together also serve as a strong reminder that Lena will never go down the same path her mother does and that she uses the Luthor instincts to do good. I’d say the debate on whether Lena will end up good or bad has been well and truly put to rest. The final clue leads the team to Washington D.C. where Eve lies in wait. Tensions are very high as the Alien Amnesty Act is repealed. Eve’s image inducer appears to malfunction during the announcement which clues Kara in on her whereabouts. Having all of this look like an accident while being a very deliberate trap is all good in concept but the execution is very weak as it is so obviously a trap. The apparent malfunction appears for long enough on a nationally televised announcement for anyone to notice it so it isn’t exactly subtle. Similarly having Eve apparently hide in the only car immune to Kara’s X-Ray vision is so blatant a trick that anyone should have seen it coming. Instead Kara brazenly plays right into Eve’s hands which ends up making the ending possible and nobody even suggests that it might be a trap despite how many geniuses there are. It could have been that the script called for the situation to appear to be more subtle but what plays out on screen is laughably obvious. Fortunately this doesn’t undercut the power of the ending. 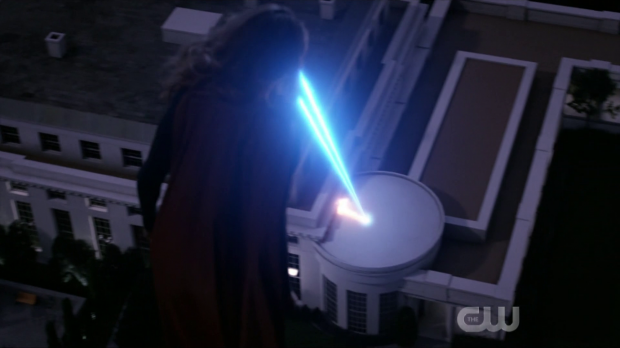 Dressing Red Daughter in the Supergirl costume and having her attack the White House is really powerful as it plays right into the idea of Supergirl being a symbol of cooperation and hope. Having this attack come right on the heels of the Alien Amnesty Act being repealed draws a line between her actions and perceived motivations. For some it won’t be hard to believe that Supergirl would be driven to violence after the Act that she was such a staunch defender of was repealed. This could end up damaging Supergirl’s image irreparably in the eyes of the public not to mention her being named as Public Enemy Number 1 by the President. 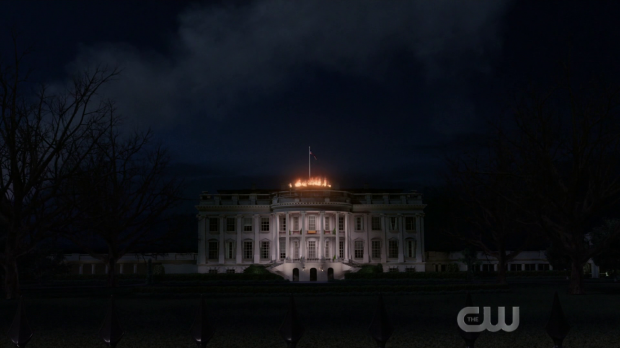 Her attack on the White House is also very symbolic as the building is a clear monument to America’s culture and values so the attack clearly says that Supergirl no longer values them after what has happened. It also proves the point about how dangerous aliens can be with very little that can be done to defend against attack. In short this action is devastating and the episode really makes the audience feel that. The best thing about contextualising the events of the season as an elaborate scheme by Lex Luthor is how all of it fits nearly together. Ben Lockwood has been acting just as Lex wanted him to even though Ben felt that he was making his own decisions. It works on two levels as Ben still has plenty of agency as we’ve seen but Lex is intelligent enough to be able to pull his strings without him having any idea of what’s going on. James challenging Ben on his understanding of the situation clearly gets to him as he starts to put the pieces together in his head and figure out what’s really going on. He sees the fake Supergirl attack for what it is and clearly doesn’t approve of it because that isn’t how he wanted to achieve his goals so I wouldn’t be surprised if Ben ends up siding with Kara in order to clear his own name in terms of the knowledge of his involvement in all of this. There’s a lot of intrigue built from this particular action and there’s still time in the remainder of the season to cover it in detail. Kelly sticks around mostly to hassle James into seeking help for the clear trauma he has experienced. This really doesn’t work as she’s very pushy and not at all supportive. At first she’s hurling referrals at him before berating him for avoiding triggers. I’m far from an expert when it comes to what is medically best for this sort of trauma but none of this feels the least bit helpful as James is being forced into taking action which understandably upsets him. Eventually he does realise that he needs help when the Supergirl attack is witnessed through his distressed perspective and asks for the help that he needs. This isn’t a bad idea and Mehcad Brooks sells James’ vulnerability really well but the way it’s presented is really awkward. I think more superhero shows should deal with the long term effects of constantly being in mortal danger rather than having ostensibly normal people shrug it off and return to their normal lives immediately after but having Kelly basically bully James into seeking help isn’t the right way to go about this. Some time is devoted to the strained relationship that exists between James and Kelly. She only seems to visit him when he’s in the hospital -which seems to be fairly frequently- which makes James feel that she only comes to him when he’s at his weakest so that she can exert some sort of control over him. James’ acceptance of his need for help and going to her to get that clearly sets the stage to explore their particular brother/sister dynamic and offer greater insight into James through his background. It’s about time the writers found something meaningful to do with James as a character though the setup could have been handled with far more sophistication. J’Onn’s ongoing quest to find a way of life that works for him receives attention in a big way when he conjures up M’Yrnn’s spirit to explore his self doubt. What basically happens here is J’Onn confronts his own uncertainty in an effort to find a way to move forward. M’Yrnn is a manifestation of how J’Onn remembers him so plays a very defined part in this by helping J’Onn see what he essentially already knows. At first he addresses feeing unworthy to be the host of the history of his people which causes M’Yrnn to call his bluff and threaten to take it away because embracing violence is exactly the opposite of what he should be doing. This directly addresses J’Onn’s misguided feelings on this detail and causes him to realise that he should find his own way to honour his people and live his life. It’s a solution that has been staring him in the face all along but he has been unable to come to that conclusion because he feels beholden to a promise that he never actually had to make. David Harewood’s performance throughout is nothing short of excellent culminating wonderfully in his declaration that he identifies as the Martian Manhunter and knows what his path should be. 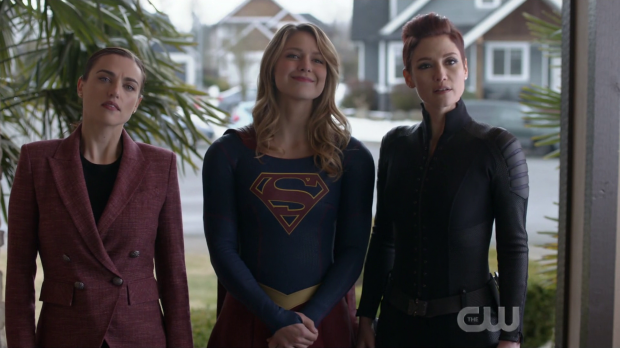 A strong episode that makes great use of a Kara/Alex/Lena team-up while delivering a devastating ending that sets the stage for the rest of the season. It’s always a pleasure to see Kara, Alex and Lena work together on a problem. This episode makes great use of them both individually and collectively as they compliment each other with their unique skills at various points whether that be Kara’s empathy or Lena’s scientific skill. There is a resolution of the animosity between Kara as Supergirl and Lena when Kara is forced to admit that Lena is right about all the good she has done by researching the Harun-El. This plays into Kara’s insecurities about the level of responsibility she has and her ability to shoulder it leading to an excellent acted monologue from Melissa Benoist. This resolution does seem to assume that Lena is absolved of any responsibility when the issue should be more complicated than that but at least it appears this isn’t to be drawn out any longer. The attack on Washington D.C. is the result of a painfully obvious trap that makes more sense in concept than execution. This doesn’t rob the sequence of its power as the depiction is devastating and has a great deal of depth on a symbolic level. Ben Lockwood realising that he has had his strings pulled for quite some time without realising it adds another layer to this setup as well. Kelly practically bullying James into seeking help for his trauma really doesn’t work because it comes across as being invasive rather than supportive. James is right to react the way he does. It’s another example of the intent being clear while the execution lets it down. The potential exploration of the background of Kelly and James’ relationship through him going to her for help with his issues has a lot of potential and could provide deeper insight into his character rather than letting him stagnate as he has before now. It’s somewhat disappointing that this episode does little to remedy the shallow characterisation of Eve since the reveal that she has been working with Lex. Curing her cousin is definitely an act of kindness on her part which suggests that she is an exploitable weakness within Lex’ organisation but the episode can’t seem to decide if the characters know her well or never knew her at all. Either way she’s so passive in this story and it’s a definite weakness. J’Onn communing with his father’s spirit works brilliantly to further his journey towards finding the best way to move forward with his own life. M’Yrnn is a manifestation of how J’Onn remembers him so doesn’t tell him anything he didn’t already know but lets him sort through his uncertainty and realise that he has to find his own way to live that will honour his people. 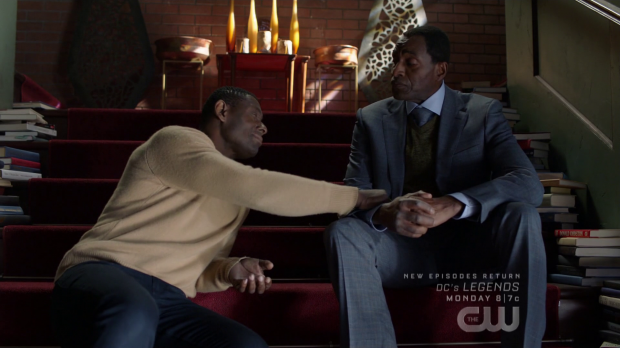 It’s really powerful and David Harewood’s performance is excellent.